At the end of 1862, the Gold Coast was very peaceful and prosperous. The serene atmosphere could have lasted much longer, had it not been for Kwaku Dwanin’s thievery. Kwaku Dwanin, an Asante chief, stole gold nuggets from King Osei Kwaku Duah and sought refuge in the Protected Territory. Osei Kwaku Dua, sent an emissary to Cape Coast. The emissary carried the Asantehene’s Golden Axe, to show the matter was very serious one. The Asantehene’s emissary told the Governor, Mr. Pine. that Kwaku Dwanin had broken the Asante law and should be surrendered. The Governor, with the backing from the British Home office, and the Duke of Newcastle, refused to release Kwaku Dwanin, to face the certain death penalty in Kumasi. Kumasi felt disrespected, they started to prepare for war. Kumasi began to purchase large quantities of arms and ammunition from the Dutch territory of Elmina, despite protests from neighboring Cape Coast. By early 1863, Kumasi had completed her war preparation. The 1863 ASHANTI INVASION OF THE PROTECTORATE. The Ashantis crossed the Prah river and marched on the protectorate on 3 fronts.
. One division of 2,000 men marched to Wassaw to contain any possible uprising from Wassaw and Denkyirah.
. A second division of 8,000 men used the main road from Praso to move into the middle of the protectorate.
. Owusu-Kokoor, the king’s uncle, marched the main body of 20,000 men on the East of Fanti, through Akim. Gold Coast troops, consisting of the Gold Coast Corps and Regimen from West Indies, were caught unprepared. The Gold Coast regiment had been stationed at Accra, Prampram, Kwantanan and Kpong to collect the fines imposed upon the Krobos for their 1858 rebellion. The Colonial government, immediately pulled all her troops back from the Krobo lands. The Government also got unexpected help from a detachment of 2nd West Indies Regiment, which opportunely had arrived in a transport from Lagos. The natives from the protectorate, volunteered in their huge numbers, to offer their services to the Governor. They were grouped into two bodies. Those from Agona and Gomoa were encamped at Essikuma; those from Denkyira, Arbrah, Assin, Anomabo and Cape Coast were camped at Manso. Owusu-Kokoor, met no resistance at all in West Akim; he routed the Essikuma based Agona and Gomoa native forces in less than 6 hours of engagement. On April 19 1863, 400 Government troops led by Major Cochrane, and 70 Cape Coast native volunteers, began their march to Bobikuma via Mankessim. The deployment was to halt further advancement of Kumasi forces on Winneba and Accra. By 10th May, 1863, Kumasi forces were within 400 meters of the Major Cochrane’s men and 20,000 native-contingent at Bobikumah. Major Cochrane decided not to attack the Ashantis. He was in no fighting mood. He retreated his contingent back to Adijuma, and left only a remnant of native volunteers at Bobikumah. Cochrane infact, then took a vacation at the sea-coast town of Mumford. On May 12,1863, Owusu-Kokoor, routed and destroyed Bobikumah within 3 hours of an afternoon encounter. He further destroyed many neighboring towns, he never entered Adijuma. Owusu-Kokoor retreated to Akim Swedru on May 24th 1863. From Akim Swedru, Owusu Kokoor, sent a Fanti captive with a message to the Governor: Give up the refugee (Kwaku Dwanin) or Choose a Prolonged war. The governor chose the latter. After having received the Governor’s message, Owusu-Kokoor strategically changed his mind: he decided to defer further operations till the next dry season, since the rainy season was fast approaching. The natives in the protectorate were disappointed that Major Cochrane could not confront Owusu-Kokoor, and had allowed him to burn, ravage and slay them. They sent petitions to the Governor clamoring for the removal of Major Cochrane. THE DUTCH HELPED THE ASHANTIS. The natives accused the Dutch authorities for allowing the Ashantis to buy arms and gunpowder freely, from Elmina. The Dutch Governor, Colonel Elias, managed to provide strategic information to Owusu Kokoor, during his attacks on the British Protectorate. The Dutch government purchased slaves from the Ashantis, and sent them to Java to serve as soldiers. Ashantis bought Arms and Ammunition from Dutch in Elmina. Governor Pine appealed to the Home Office for logistics, and reinforcement. The 4th West Indies Regiment of 850 men under Lt. Col. Conran was rushed to Gold Coast on August 13, 1863 to replace Major Cochrane and his useless Gold Coast Corps, which was subsequently disbanded. Preparations for taking back the fields were recommenced. The British Home Office wanted the reinforcements from the West Indies to just clear the protectorate of all Ashanti elements. Governor Pine, however wanted more; he wanted to attack Kumasi. He asked the home office for more reinforcements. He only succeeded in getting a promise of additional 300 men from the 1st West Indies Regiment. Governor Pine was, however, given the choice of taking the battle to Kumasi, if initial attempts of achieving peace with Kumasi were not feasible. Governor Pine, established a troop supply depot at Manso and Col. Conran moved about 1000 troops from Cape Coast to Praso on February 5th 1864. At the same time, Accra-based troops also moved in to Akim Swedru. The troops at Praso were tasked to fortify their post, convey supplies and clear the forest around the camp, and on the banks of the Prah river. It was in the rainy Season and the troops had to be encamped under shelter tents on wet grounds. Dysentery and Fever caught up with the West Indian troops, a quarter of them needed hospitalization. The 300-man troop reinforcement from the West Indies arrived on April 9th 1864. The home office hastily called off the assault on Kumasi, when it became alarmed at the loss of lives of troops from Dysentery and Fevers. The troops retreated back to Cape Coast on July 12th, and embarked for the West Indies on July 27th 1864. Only the 4th West Indies Regiment was left to garrison the forts. Thus, the campaign of 1864 was terminated without firing a shot. The abortive 1864 campaign made the home office rethink about the colony; it decided to gradually, withdraw from the Gold Coast, in a dignified way. In the meantime, the Governments of the Gold Coast, Lagos, Gambia were placed under a Chief Governor, who resided in Sierra Leone. The Governor in chief visited his dependencies, once a year. Only the Chief Governor could directly communicate with the Colonial office. The Colonial Government made several abortive attempts to make peace with Kumasi in 1865. Mr. Blankson, a merchant from Anumabo knew most of the Kumasi kingmakers and he offered to mediate. Kumasi sent her envoys to Cape Coast to transact the terms of the peace deal. Colonel Conran on January 16 1866, announced that Kumasi had come to beg for a peace deal, as he welcomed the Kumasi envoys to Cape Coast. Kumasi felt disrespected and declared that until Dwanin was given up, Kumasi would not communicate with the Protectorate Government anymore. OSEI KWAKU DUAH DIES; KOFI KARKARI REPLACES HIM. Asantehene Osei Kwaku Duah died on April 27th 1867. The tradition at the time was that, upon the death of an Ashanti king, any Oheneba (Ashanti Prince) could slaughter non-royal subjects to accompany the dead king as servants. Unfortunately, a prince, Oheneba Asuo Boakye, slayed a nephew of Asamoah-Nkwata, the Ashanti Army Commander. Asamoah Nkwanta became furious; how dare someone from the Kumasi palace, slay his (Asamoah-Nkwanta) nephew. Asamoah-Nkwanta was hurt; he threatened to pick-up arms and march on the Kumasi palace. A Kumasi civil war was averted when, after lengthy negotiations. It was agreed that the culprit, Oheneba Asuo Boakye, and two of his sisters would be handed over to Asamoah-Nkwanta to be sacrificed. After this incident, General Asamoah-Nkwanta became disinterested in the affairs at the Kumasi palace and retired from active military duties (temporary). Elmina resisted attempts by Sir Arthur Kennedy, the Governor in chief who had arrived in Cape Coast on a tour of inspection, to enter into alliance with the Fantes, Denkyiras and Wassaws against the Ashantis. To the states of the protectorate, Elmina was an Ashanti mole. What caused the second invasion of the protectorate in 1873? It was the transfer of the Ashanti territory of Elmina township and forts to the British that precipitated the need to invade the protectorate. Elmina Chief Andor and his sub-chiefs had been in Kumasi for Osei Kwaku Duah’s funeral. A detachment of about 300 armed men, under the command of King Kofi Karkari’s uncle, Akyampong, accompanied chief Andor to Elmina to establish an Asante Military base in Elmina. Akyampong was a blood-thirsty man, who committed a lot of atrocities (beheadings, beatings, body-dismemberments) against any Fanti, Wassaw, and Denkyira who came across his path. To have free access to the river Volta, the Ashantis established alliances with the Awuna (Anlos) and the Akwamus. The only major resistance to the free access, was Peki a.k.a. Krepi. Kumasi’s aim was to gain access to the eastern territories, so that they might eventually, invade the protectorate from all sides. Akyampong was sent to Elmina for a reason: At the right moment, Akyampong was to attack the protectorate. It would be a three prong-attack: Akyampong would attack the protectorate from Elmina on the west, Adubofuor on the East, while King Kofi Karkari himself would cross the Prah to attack the heart of the protectorate. Adubofuor did not have it easy at (Peki) Krepi. Dompreh, the Krepi military leader, was resilient, and tactically superb. Always outnumbered by the Asante forces, Dompreh returned again and again to the struggle as if invigorated by defeat. The indefatigable Dompreh, once inflicted heavy defeat on Adubofour in October 1869, taking several Ashanti P.O.Ws. Kumasi had to come to the bargaining table, to save Adubofuor and his men. Kofi Karkari sent a message to the colonial government to express his readiness to exchange the missionaries for Ashanti prisoners. On November 2nd 1869, the Ashanti hostages, including Kwame Opoku, Adubofuor’s son, and other prisoners of war, were taken from Akwamu to Cape Coast for safe keeping. By the way, Adubofour eventually, killed Dompreh but not before losing some 136 important chiefs and over half of his initial 30,000 strong Army. By 1869 the Home Government had acquired more territories from the Dutch and has abandoned the 1865 notion of withdrawing from the Gold Coast, and to leave the natives to govern themselves. The Elmina-Ashanti connection, can be traced, way back to 1811, when an Army from Kumasi was sent to relieve Elmina, which had been besieged by the Fantis. From the traditional sense, the Elminas had become Ashanti subjects and Elmina was an integral portion of the Ashanti kingdom. The Ashantis claimed to the ownership of both Elmina and the Elmina castle. Since 1863, there had been no peace between the Ashantis and the protectorate. Elmina was the only town that had strong bond with the Ashantis. Akyampong was in Elmina, waiting for additional 5,000 Ashantis who had been held on the border of Assini, pending permission from the French Authorities for passage through French territory and join him. On April 17th 1872, the Dutch ceded the whole of their possessions on the Gold Coast to the British, who paid 3,790 pounds for certain stores that were in the forts. Elmina and the Elmina castle came under Britain, without the knowledge of Kumasi. Kumasi did not want to lose Elmina to the British. They decided to go war with the British and the protectorate. However, they needed more Arms and ammunitions before starting the war. Kumasi managed to hide their war preparations, from the British. On April 20th 1872, Colonel De Haes, the Dutch commissioner, induced Kumasi to accept the transfer. He wrote a letter to the Asantehene. He formally, informed the Asantehene of the transfer and sent schnapps and many gifts and as a token of friendship. He also told the Ashantis that he had lifted the trade embargo on munitions of war. The Dutch also promised to double the sum of the annual payments by the Dutch for Elmina to the Ashantis. Ashanti has expended vast quantities of ammunition in the war with Krepi; and, while the embargo remained, could only obtain fresh supplies by the long and circuitous route, through French Assini. A forty thousand strong Ashanti Army, under the general command of the chief of Bantama , Amankwa-Tia, marched from Kumasi in three divisions.
. One division was to march against Denkyira, under General Adubofuor.
. Another division was to march against Akim. The third division against the despised Fantis. Amankwa-Tia had observed Adubofuor bring many captives from the Krepi war. As Bantama chief, he was traditionally, supposed to defend Kumasi and not to go after enemies. He wanted captives of his own. The Ashantis crossed the Prah river at Praso and Attassi; about 30 men were lost by drowning in the passage. The states in the protectorate never wanted any war confrontations with the mighty Ashantis. The towns in the protectorates had assumed the British Government would fight for them. The government was not prepared for the 1873 Ashanti invasion of the protectorate. Col. Harley had only 190 rifles and 381 flint muskets for issue. He reported the invasion to his boss in Sierra Leone, Mr. Pope Hennessey and asked for troops reinforcement. Mr. Hennessey did not believe Col. Harley’s message. He thought Ashantis had been amicable and at peace with the government. Col. Harley asked the chiefs to form a united front to fend for themselves, while his troops focused on defending Cape Coast. The protectorate natives formed volunteer groups to resist the Ashanti invasion. The Ashantis had more fire power and numerical strength than the volunteer groups. Amankwa-Tia and his 18,000 troops attacked allied camps along its 6mile front. The allies fought back to hold their positions and after 5 hours of intense battle Amankwa-Tia retreated. Lt. Hopkins of the 2nd West Indian regiment, whose primary task was to protect Cape Coast castle, urged the chiefs to take the offensive, but the protectorate chiefs excused themselves on various pleas, and decided to await another attack from the Ashantis. The Ashantis however, had been baffled at the unexpected resistance they had met with, and has decided to remain quiet and proceed with caution. Ashantis again attacked the allies on their front line. The allies had a rocket battery, which they fired at Ashanti positions. The Ashantis became disheartened by the unexpected resistance they had been met with and started to retreat. The Ashantis had destroyed much of their baggage, when they heard the allied forces, too, were running away from the frontline. The Ashantis decided to go to Dunkwa, instead of advancing on Cape Coast or Elmina. Spy reports indicated that the Ashantis had ran out of provisions, small-pox disease had broken out and the Ashanti camp was full of wounded and sick soldiers. On the Western front, Adubofuor had entered Wassaw and defeated them. The Wassaw prisoners were brought to Kumasi on April 13th 1873. Fourteen Wassaw P.O.W.s were sacrificed the next day, at Bantama, to the manes of the former kings of Ashanti. In mid-May, the Ashantis left Dunkwa for Jukwa, the capital of New Denkyira. Jukwa appealed for help and ammunitions. Fanti military chiefs decided to leave their base at Arbrakampa to go to Jukwa and help fight-off the Ashantis. There were some skirmishes around Junkwa on June 4th between the allies and the Ashantis. Here is what happened on June 5th 1873. The Ashantis were advancing on Denkyira. Kwaku Keh, the new King of Denkyira after Kwadwo Tsibu, was one of the first to take to flight. When the allies who had come to his aid asked for him, Kwaku Keh was nowhere to be found. What helped the protectorate states against the rapid advance of Ashanti troops toward Cape Coast was the outbreak of the Small Pox and Dysentery in the Ashanti camps. On June 7th 1873, a shipload of troop reinforcement from England arrived at Cape Coast on H.M.S Barracouta with 110 marines under Lt. Col. Festings. The marines marched to Elmina from Cape Coast, entered the Elmina castle and on June 12th 1873 bombarded and destroyed Elmina from the castle grounds. A month later, on July 6th 1873 a second troopship Himalaya, brought more reinforcement from the West Indies regiment. The arrival of the troop reinforcements prevented the Ashanti troops from advancing further. Interestingly, every movement of troops was at once known in the Ashanti camp, and the arrival of this reinforcement was made known to the Ashantis even before the men landed; but no information could be gained concerning the movements of the Ashantis. The native spies were often too afraid to go near the Ashanti camps. Small pox and dysentery were killing the Ashantis so much that Kumasi determined that her army should come back home as soon as possible. Sir Garnet Wolseley was appointed by the British government, on August 13, 1873, to take over the Civil and Military command at the Gold Coast; to organize the native Army to drive the Ashantis out of the protectorate, and should he deem it necessary, to march to Kumasi. Captain Glover, the administrator of Lagos, was to operate against the Ashantis from the Volta and Eastern areas. Capt. Glover had at his disposal a 1000 Hausa speaking Nigerians and Donkors (captives from Northern Ghana) policemen and volunteers from the Accra, Ada, Krepi eastern tribes. On his arrival in September, Sir Wolseley had only the 2nd West Indian Regiment and a small body of Fanti police under his command. Wolseley sent a message to the Asantehene to withdraw his forces from the protectorate, and that if persuasion failed, force would be used. The message never reached the Asantehene; Amankwa-Tia received the message. Amankwa-Tia, unaware of Kumasi’s determination to pull her troops back home, replied to the message by saying, the King had no quarrel with the white men, and that they could have peace by surrendering Denkyira, Wassaw, Assin and Akim to Ashanti. Maj. Gen. Wolseley realized that the protectorate natives were too afraid to fight the Ashantis. Military officers were sent along the coast between the Gambia and the Niger to recruit other West African natives. They had a few men from Sierra Leone, 120 Kussus from Sherbo, 100 men from Gambia 53 Opobos and 104 Bonnys from the Niger delta. Of the 40,000 men that left Kumasi to attack the protectorate, only 20,000 men returned to Kumasi on December 22nd 1873. Most of the 20,000 men died from the Small Pox epidemic and Dysentery which had devastated the Ashanti camps; less than 3,000 Ashantis had died in actual battle. 280 chiefs had fallen in battle or succumbed to disease; Captains who went out in command of twenty men returned alone with their baggage on their heads. Kumasi was thrown into mourning; Kumasi turned red. Major Home supervised the Royal Engineers to establish roads to link Cape Coast and Prahsu. Two hospitals, many bridges and several camp sites were established along that road. The Naval Brigade built a bridge across the Prah river and used 2 and half weeks to establish their military base there. The main body of 3 European Battalions (Naval brigade, Wood’s and Russell’s regiments) was to attack Kumasi directly from Praso. The 1st and 2nd West Indies Regiments were to guard the lines of communications. The Awunas did not want their Ashanti Allies to be attacked. They planned a diversionary tactic, in early October, by plundering and burning stores in Keta. Capt. Glover requested a 6–week delay, from Wolseley, to enable him deal with the Awunas. Sir Garnert Wolseley would however, have none of that; he ordered the Captain to proceed with his well-disciplined troops, and the native volunteers to the Prah river immediately, and abandon all operations against the Awunas. It was essential for Capt. Glover to cross the Prah River before January 15th. Captain Glover left his Awuna campaign in the hands of Lt. Moore and the native volunteers and proceeded to the Prah river with his Hausa and Adonkors on December 29th 1873. All prisoners (Europeans and Africans) must be released at once. A treaty of peace to be signed in Kumasi, and that Sir Wolseley would proceed with adequate number of European soldiers to ensure the safety of the European hostages. King Kofi Karkari in his reply, begged Gen Wolseley not to set his foot on Kumasi (the king had feared that the presence of European troops in Kumasi would be regarded by neighboring states as a downfall of Kumasi without a struggle). Kumasi was not in the mood to go into another war, after losing so many men in their attack on the protectorate, a year earlier. They were being forced to defend themselves against the invaders. Asamoah-Nkwata, assumed command of the resistance forces. Even though Kumasi had the number of personnel to defend the state, they had outmoded weaponry. Whereas the invading force had breech-loading Sniper Raffles, Field Guns and Rockets, the Ashantis carried only Flintlock Muskets, loaded with rusty iron, pieces of lead and stones. It was this British fire-power that ensured them of victory. European troops started to cross the Prah river. (About 40 out of 250 Naval Brigade, and 57 out of 650 Rifle Brigade, within three weeks, has fallen sick due to the harsh weather and had to be sent back to Cape Coast.). Kumasi was prepared to accede to all the demands in order to prevent the Europeans from entering Kumasi. A forward supply depot was established at Fomena. Wolseley resumed his forward march to Kumasi, after accumulating his reserve supplies. He captured Ejisu, Odumase and Konongo. He then blocked a 12,000 strong contingent from Dwaben, from joining the Ashantis. Retired General Asamoah-Nkwanta resumed command of the Ashanti resistance against the allied forces at Amoafu(near Bekwai). Characteristically, the Ashantis had a tactic of encircling, and cutting-off the supply lines of their opponent, with their huge numbers. The British were aware of Asamoah-Nkwanta's tactics. The British troops adopted a four-sided formation with a large open square. The leading column (the 42nd regiment) advanced on the main road and attacked the center of the Ashanti troops formation. The right and left columns cut a path parallel to the main road, but through the bushes; they blocked the Ashantis from attacking their flanks (the Benkum and Nifa wing-attacks). The Rifle Brigade closed the rear of the square. The persistent firing of rifles and the continuous advance, of the 42nd regiment did not give the Ashantis the chance to reload. At the end of the day, Major Baird and 2 privates of the 42nd regiment and I allied native were dead, with 21 officers, 139 Europeans and 34 native allies wounded. The Ashanti losses were alleged to be very heavy; but only about 130 dead Ashantis were found and buried by the invading troops; it was not the custom of the Ashantis to carry off their slain, unless they were chiefs. Among the slain chiefs were Amankwa Tia, who fell on the left, and the Mampong chief, who was killed on the right. Adansi soldiers attack the Allied garrison at Fomena. Two British officers and two soldiers were wounded. The forward march to Kumasi began. The Ashantis formed numerous ambushes, from which they fired and retreated, inflicting losses on the invading troops at every discharge. The last defensive position the Ashantis took was on the northern bank of the Oda river. The invaders constructed a bridge across the Oda river. King Kofi Karkari sat under a large red umbrella and watch the battle wage on. He disappeared to Manhyia, when he realized the battle was lost. The village of Odasu was taken after several hours of battle. It was 2 pm when a dispatch from Gen. Wolseley, reached the invading troops that they could take Kumasi that evening. The troops raised a massive ringing cheer; firing from the Ashantis immediately ceased. The Ashantis instinctively knew that the battle was lost. For the Ashantis, an Army was lost as soon as it was outflanked. The Ashantis could not understand how the invading force could still push forward, despite the invaders being outflanked and shot at. That baffled the Ashantis; they lost their self-confidence and suffered defeat in a big way. Sir Allison led the main body of troops (Rifle Brigade and the remnant of the 42nd regiment) to advance toward Kumasi. Here is how a soldier described the war scenery: The whole Ashanti broke and fled in the wildest disorder down the pathway on their front to Kumasi. The ground was covered with traces of their flight. Umbrellas and war-chairs of their chiefs, drums, muskets, killed and wounded covered the whole way, and the bush on each side was trampled as if torrent had flowed through it. 118 officers, 1044 European soldiers and 449 natives engaged the Ashantis at Qdasu. Lt. Eyre and 10 native allies were killed; 6 officers and 60 men were wounded. On the outskirts of Kumasi, the invading force found a number of executioners armed with knives on the point of killing a man, who was to be offered as a sacrifice to the Ashanti-gods, to stop the Enemy’s advance. At 5:30pm. The 42nd entered Kumasi without opposition. As the troops moved to the palace, many spectators from the town came up to the soldiers and shook hands. The spectators seemed to have no feeling but that of wonder and pleasure, laughing and uttering cries of amazement and delight. The Kumasi townswomen cheered and fetched water for the much thirsty invading troops. Maj. Gen Wolseley arrived at 6pm. with the rest of the troops. Picquets were placed at all the main entrances to the town, and at the town’s market-place. The King, Queen-mother, and all the persons of distinction had disappeared. No Kumasi native “knew” the whereabouts of the King and his executives. However, Owusu-Korkoor, the same person who led the 1863 invasion of the protectorate through east Akim, promised to deliver all messages to the king. Maj. Gen. Wolseley sent a message to the king, “If the king, the Queen-mother, Oheneba Mensah would come to see the me the next day, they would be treated with honor and allowed to return in safety.” The Maj. Gen. warned that if a single shot was fired against the troops in Kumasi, the town would be destroyed and every living person in it put to death. On the other hand, if the king would come in to treat, the town would be untouched and the troops would leave it as they found it. Wolseley allowed the townspeople to remove their valuable items from their homes, except their ammunitions. An Ashanti crier went around and proclaimed, in the name of the king, that no one was to attack or molest the troops. Fanti prisoners, who had been released from “log” set incendiary fires across the town, and looted Ashanti properties. The occupying troops tried all-night to put out the fires. A Fanti policeman, caught in the act of setting fires, was hanged, while Fanti porters were flogged. The destruction of Kumasi, caused by these fires, broke the king’s heart; he never showed up. By daybreak next morning, the entire Kumasi township was deserted; the king’s palace was left unprotected. Sir Wolseley placed men of the rifle Brigade to guard the palace, thirteen sentries were tasked to watch all the entrances. The troops did not know of Bantama, where the Ashanti treasures were stored. The king never showed up. Gen Wolseley, having waited long enough for the king to appear before him, sanctioned the preparation of mines that would destroy the Kumasi Palace. The town was set on fire. At exactly 9am. one full hour after the main body of troops had left Kumasi, the mines in the palace were fired, and the 42nd, who formed the rearguard, quitted Kumasi. 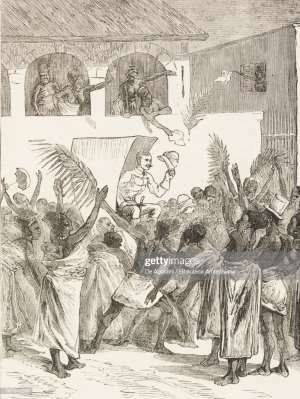 Maj. Gen. Wolseley arrived at Cape Coast; where he was received by thousands of Fanti women, who were painted white and sang joyful songs to praise the General. By the 27th, all the European regiments had embarked; the 2nd West Indies also left. Only the first West Indies regiment remained and they were distributed between Prahsu, Mansu, Cape Coast and Elmina. Wolseley sailed for England on March 4th 1874. Source: Alfred Burdon Ellis: a history of the Gold Coast of West Africa. Vitamin D, Time To Check Your Blood Vitamin D Levels.